Bishop Michael Curry cited the words of Martin Luther King Jr. during the wedding ceremony of Prince Harry and Meghan Markle. Published On May 19, 2018 Credit Image by Pool photo Owen Humphreys. 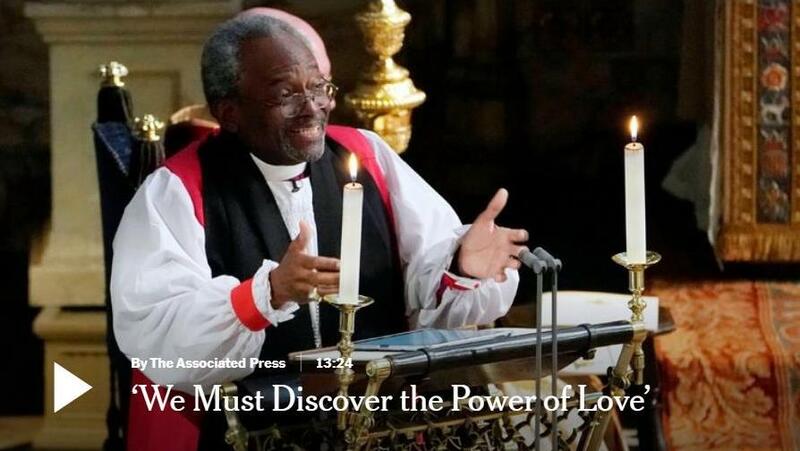 ‘There’s power in love’: Read the words of the presiding bishop of the Episcopal Church in the United States, who spoke at the wedding of Prince Harry and Meghan Markle. Keep your fascinators, tiaras, regalia and romance. What if the surprise biggest star — the Pippa Middleton, if you will — of this royal wedding was a sermon about love? Michael Bruce Curry, the presiding bishop of the Episcopal Church in the United States, delivered a searing, soaring 13-minute speech, imploring Christians to put love at the center of their spiritual and political lives. Until that moment, the ceremony had been quite staid, stuffy even, with only the mention of “sexual union” to keep us on our toes. With its repetition and emphasis, his sermon drew upon the devices of black ecclesiastical tradition. It was a striking contrast with the one delivered by Richard Chartres, the Bishop of London, at the royal wedding in 2011. “Imagine governments and nations where love is the way,” Most Rev. Curry said. “Imagine this tired old world when love is the way — when love is the way, unselfish, sacrificial, redemptive! … When love is the way, poverty will become history.” He cited Martin Luther King, Jr. explicitly several times, and alluded to the same passages in Amos — “let justice roll down like a mighty stream and righteousness like an ever-flowing stream” — that King famously cited. Bishop Curry, 65, said Christianity was “a movement grounded in the unconditional love of God for the world and a movement mandating people to live that love and in so doing to change not only their lives but the very life of the world itself,” he said. He spoke about the power of love and faith, even to comfort those in captivity, referring explicitly to the psalms sung by slaves in the American south. The bishop was born in Chicago in 1953. Married with two daughters, he acquired a measure of fame outside the religious community after a sermon he delivered in 2012, “We need some crazy Christians,” was widely viewed online. He is the first African-American leader of the Episcopal Church.